Synonyms: Neogomesia agavoides, Marcelino Castañeda y Nuñez de Caceres 1941. Photo by Marc Altenloh. 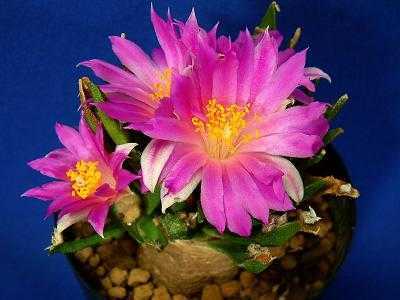 This member of the Cactaceae family was given this name by Edward Frederick Anderson in 1962. It is found in two locations in Mexico: San Luis Potosi and Tamaulipas. It grows in grit or other well drained soil with little to some water and lots of sun. 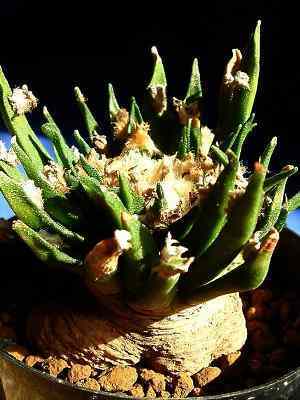 The caudex can grow to five centimetres in diameter, the plant will grow to six centimetres height, twelve if the caudex is exposed. The flowers are bright pink. The name "agavoides" means looking like agave.